The 2019 Game Developer’s Conference (GDC) kicked off yesterday in San Francisco and the Wacom team is already there connecting with developers and artists. Hopefully they’re also learning from all the keynote presentations (don’t party too much, guys). If you’re a game developer or game artist , GDC is the place to be to network, share and job hunt. And if you’re into tech in general, it’s a great place for big reveals and interesting discussions. This year we anticipate the biggest reveal will be Google’s Project Steam announcement, which is essentially a Netflix for gaming. Fun and games aside though, Wacom is at GDC 2019 for business. We’re there to show developers, studios and production houses how they can be more productive with Wacom Creative pen displays. So why should animators and game developers choose Wacom tools? For animators, drawing on a Wacom display with a pressure-sensitive pen is a real game changer. There’s simply no faster or smarter way to develop characters and iterate until perfection. Similarly, Wacom tools give game developers the control and freedom they need to go back and forth between 2D and 3D models without a glitch. Rovio Entertainment, the studio behind Angry Birds and dozens of other mobile games that are played by tens of millions of people every month, equips their team with Wacom tools because they improve their workflow and keep their development pipeline consistent across devices and projects. Watch Rovio’s team explain how Wacom products helps them every day. How does Wacom tools help character designers and 3D modelers? Game developers rely on real-time rendering, making speed and connectivity crucial, especially in 3D sculpting and modeling. Working with Wacom and applications like Pixologic Zbrush and Autodesk Maya is seamless and allows artists to quickly explore how characters will look and move in any environment. Trying to do this with a mouse would be exhausting, tedious and time consuming. 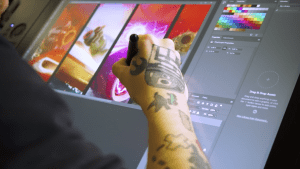 What is Wacom Bringing to GDC 2019? The Wacom Cintiq Pro family brings absolute harmony to storyboarding, 2D and 3D sculpting, modeling, or animation work. Character designers and game developers alike enjoy the Cintiq Pro’s distinct, tactile experience because its precision and ease of use increases their productivity. With a Cintiq Pro you can pan, zoom, rotate, use radial menus for advanced shortcuts, and more. Plus, Cintiq Pro comes equipped with our most advanced pen technology to date, the Pro Pen 2, which has 8,192 levels of pressure sensitivity and unmatched accuracy in every stroke. Learn more about Wacom Cintiq pro 24 & 32. The new Wacom Cintiq 16 is ideal for students, hobbyists or professionals that may not require every advanced feature found in the Cintiq Pro product line. 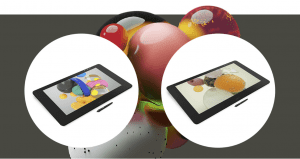 It’s a fantastic tool for digital sketching, illustration and technical drawing. It also comes with Wacom’s Pro Pen 2 technology, offering professional grade pen technology for an entry level price. It works on both PC & Mac, and supports many pressure-sensitive apps from major creative brands like Adobe, Autodesk, Pixologic,Celsys, Corel and The Foundry. Check out the product trailer below or visit our website to learn more. The Wacom Ergo Flex Arm for Cintiq Pro 24 and 32 lets artists build a professional, clutter-free workspace. We teamed up with Ergotron, the leading manufacturer of ergonomic monitor arms, to provide an arm that meets the unique needs of artists and designers who use Wacom creative pen displays. The Ergo Flex Arm has a maximum reach of 30 inches from the edge of the desk, letting you draw on your pen display comfortably at all times. The Wacom Ergo Stand for Cintiq Pro 24 allows artists to raise, tilt and rotate their canvas easily so they can work in the most natural position for them. We’ve also made it easy to adjust so artists can move it throughout the day. Once attached, the Ergo Stand makes the Cintiq Pro 24 feel very much like a drafting table, stable, secure and smooth. Learn more about Wacom’s Flex Arm and Ergo Stand. Stay tuned to find out what Wacom learns at this year’s GDC. And if you’re attending, be sure to stop by Booth S762 to try our products and chat with our team.